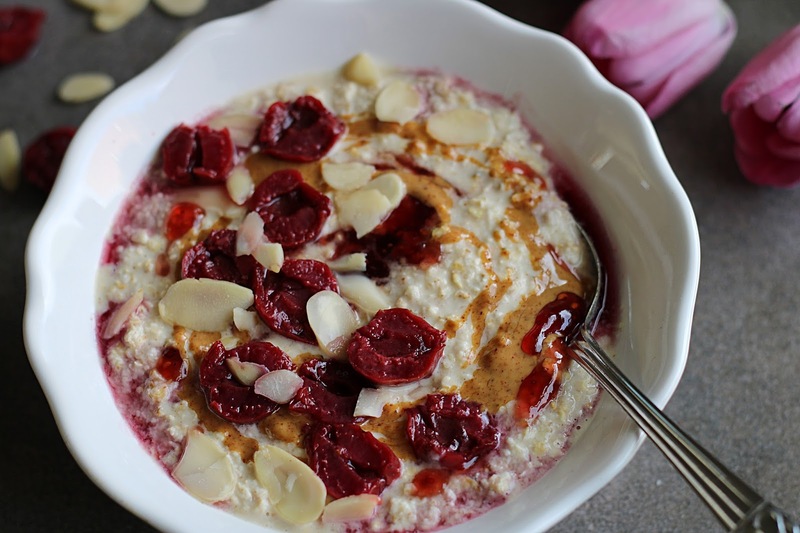 So way back in 2015 when i started my first page beautyandthebakes i made this recipe for bakewell tart porridge and it was ironically one of the most popular recipes on there. So i thought i would redo the photography and add a teaspoon of almond extract to mix the result was... well its why I'm sat typing this up on a monday night after work, they are just that good! Add in the almond flour, 1/2 the almond butter and extract to your porridge and continue cooking on a low heat for around 1 minute to make sure it all melts in. 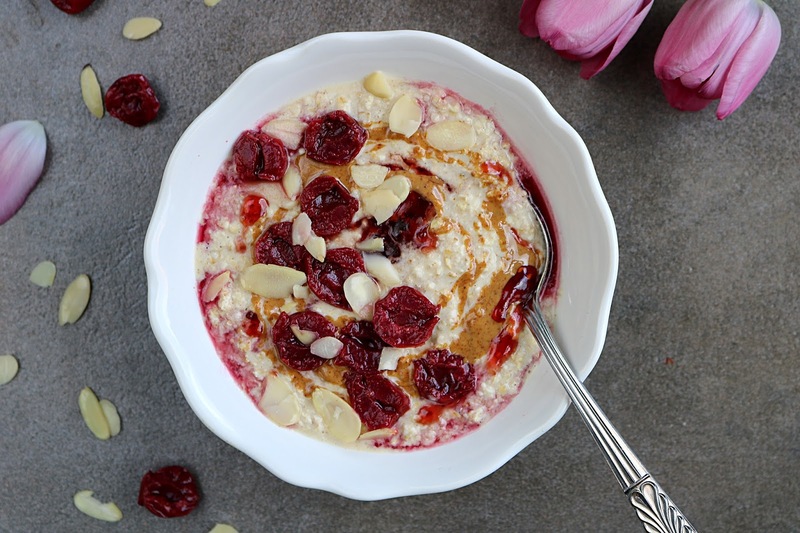 When it's ready remove from the heat dress the porridge with the remaining almond butter, jam, cherries and flaked almonds. These are the fluffiest pancakes I've ever had aside from my vegan buttermilk ones. But these ones have so much flavour, i have to say the pina colada ones are my favourite. They are all sweetened naturally and contain no sugar what so ever and are a wonderful blend of oats and buckwheat flour keep you full all morning. 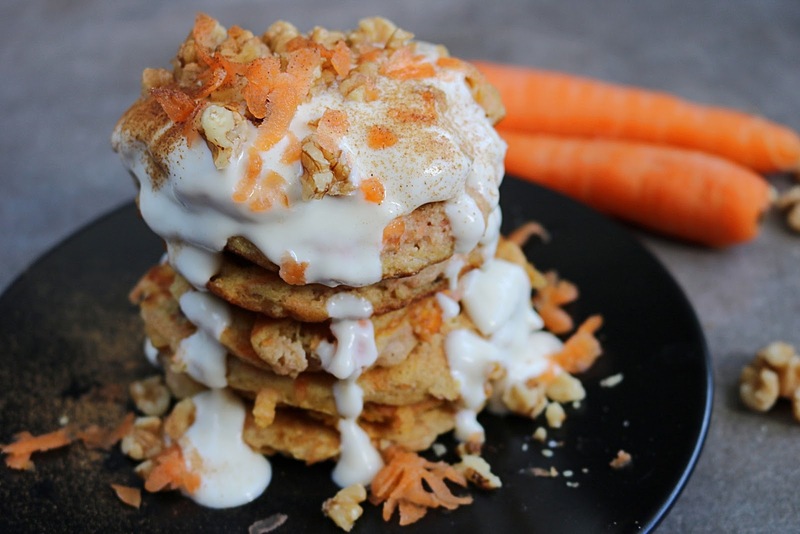 Ive been wanting to do this post for a while when i first made the carrot cakes ones and then i thought why not do the same pancakes 3 different ways. 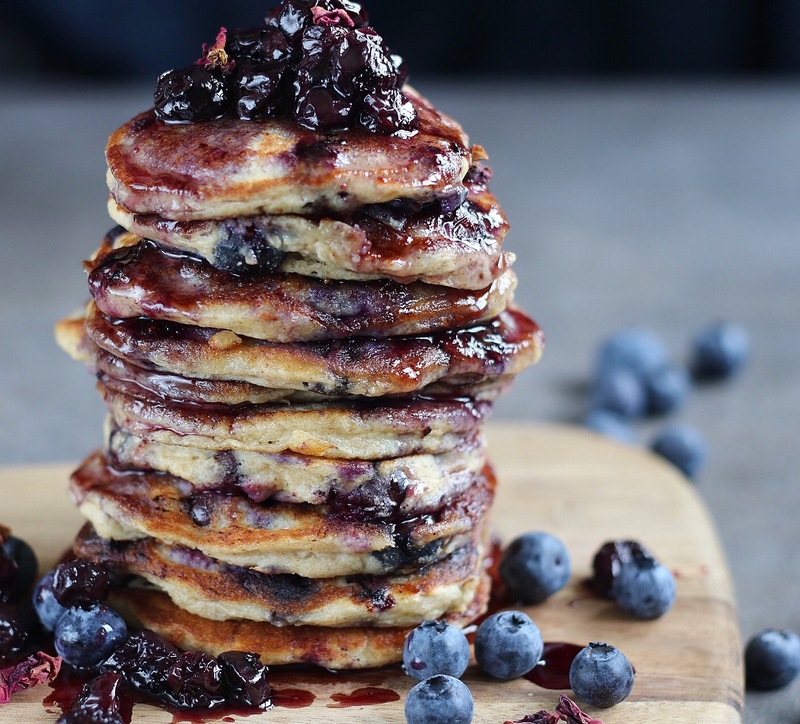 Its a really easy recipe to remember as well, i have found that a straight up egg replacer works the best with these pancakes i like to use a follow your heart egg. However ground chia egg works really well. 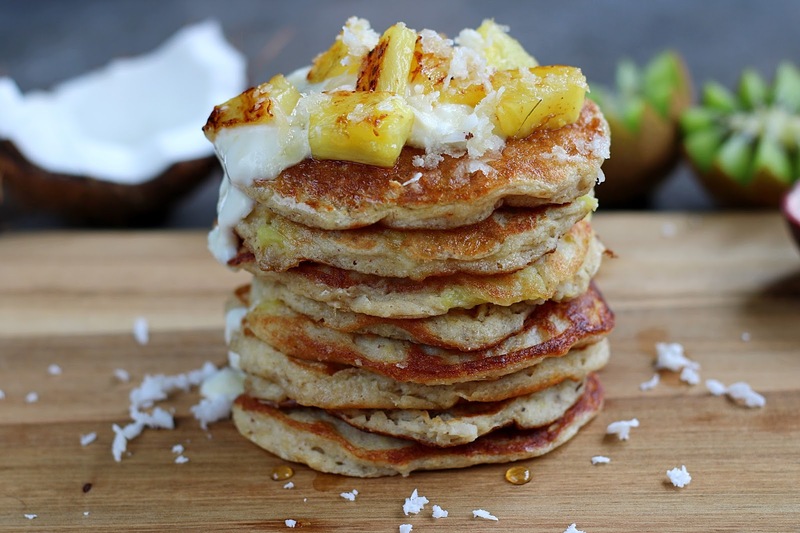 The pina colada ones came about after a recent trip to one of my favourite restaurant chains, after sipping on a few pina colada drinks i thought wouldn't it be amazing if these could be in a pancake, and well the rest is my Saturday morning creating them. Mash the banana add in milk, vanilla and yogurt and mix well. Add in the egg replacer mix in well then add in dry ingredients mix into a smooth batter then fold in the following. Carrot cake; 2 grated carrots 3tbs heaped chopped raisins 1tsp cinnamon and 1/4 tsp ground ginger. Top with yogurt, smashed walnuts and more grated carrot. Blueberry; 1 cup frozen blueberries. Top with defrosted blackberries/blueberries. Pina colada; 3/4 cup chopped pineapple, 1/4 cup fresh grated coconut. Top with yogurt a tiny algarve and pan fried pineapple. Toffee and apple are a match made in heaven right? Try adding that to a warm fluffy bun and you have got my attention straight away. 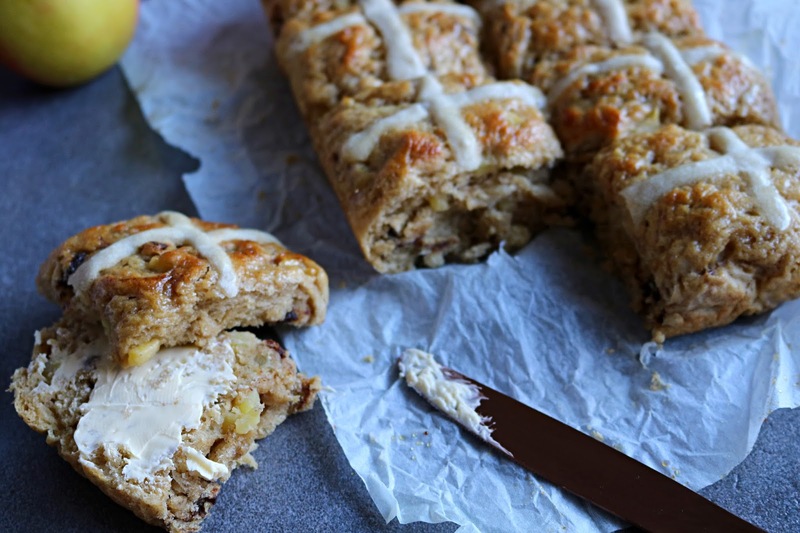 Close your eyes and imagine sweet smells of apple cinnamon wafting through your kitchen. Salivating yet? 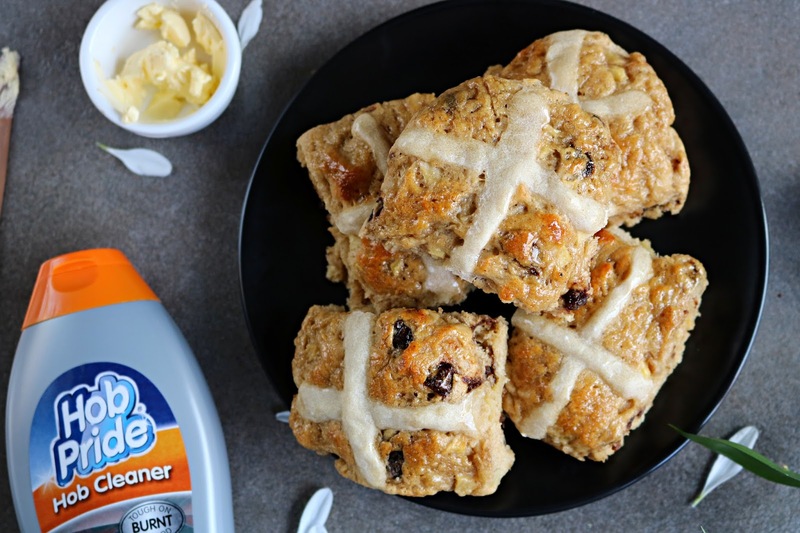 Hot cross buns were always a hit in my house every easter mum would buy a packet to have over easter weekend and they sometimes served as a cheeky breakfast. When oven pride got in touch and asked for a tweaked hot cross recipe i first thought of chocolate and orange. Tried that out first and they did turn out very nice, the orange was very strong but unfortunately it was not as fluffy and light as this flavour. Oh and these ones are refined sugar free as well, some naked toffee pieces and coconut sugar to sweeten. You get little hits of toffee then a little piece of apple bursting inside these buns, its hard to just stop at just one. 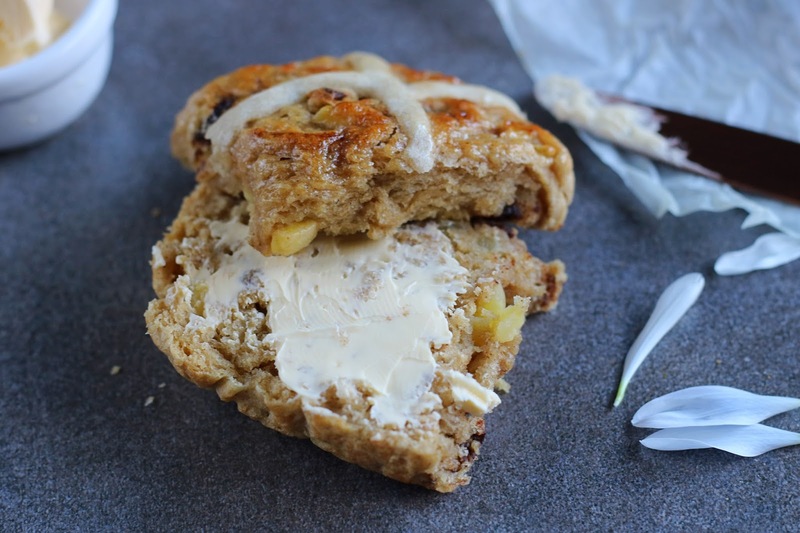 At first i thought these buns might be missing something having no eggs in or butter, but the apple sauce acts as the egg and adds to the warming apple flavour. I think it also gives them a nice texture. I used some dairy free butter and again, you cannot tell the difference. I find that a lot with dairy free baking the butter is so easily replaced in a recipe. These buns are amazing hot out of the oven, and the next day are even better toasted up and smothered in some diary free butter. I don't know what it is with things left to sit overnight the flavours just get better. 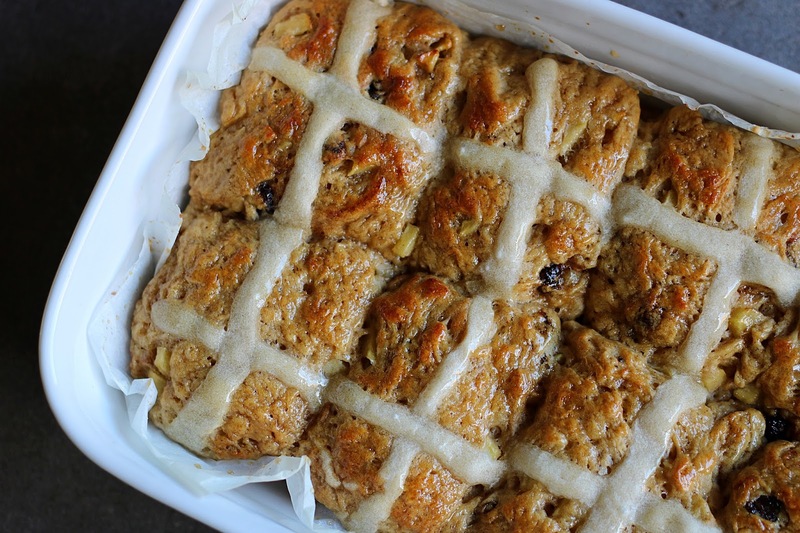 They also make a pretty amazing bread and butter style pudding if you have any left over, but who's going to have any of these hanging around for days am i right? 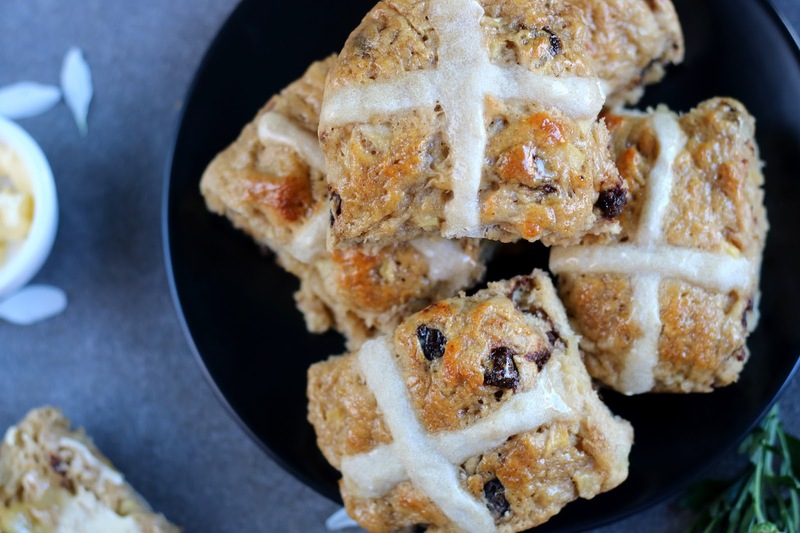 I kept the ingredients really simple so they were easy to find, also that meant it did not require more steps and waiting around, you can easily make half a batch if your not wanting to make lots. I tried a half batch in the photos and it made 8 smaller size ones easily. This recipe dose say to prove the dough 3 times before baking. I have tried this method and I've also tried just proving them 2 times and i have to say there was not much difference except the buns came out a little larger the 3 time. Bring the milk to the boil, then remove from the heat and add the butter. Leave to cool until it reaches hand temperature. Put the flour, salt, sugar and yeast into a bowl. Make a well in the centre. Pour in the warm milk and butter mixture, then add the apple sauce. Using a wooden spoon, mix well, then bring everything together with your hands until you have a sticky dough. Tip onto a lightly floured surface and knead by holding the dough with one hand and stretching it with the heel of the other hand, then folding it back on itself. Repeat for 5 mins until smooth and elastic. Put the dough in a lightly oiled bowl. Cover with oiled cling film and leave to rise in a warm place for 1 hr or until doubled in size and a finger pressed into it leaves a dent. With the dough still in the bowl, tip in the orange zest, toffee pieces, apple and cinnamon. Knead into the dough, making sure everything is well distributed. Leave to rise for 1 hr more, or until doubled in size, again covered by some well-oiled cling film to stop the dough getting a crust. Divide the dough into 16 even pieces (about 75g per piece). Roll each piece into a smooth ball on a lightly floured work surface. Arrange the buns on one or two baking trays lined with parchment, leaving enough space for the dough to expand. Cover (but don’t wrap) with more oiled cling film, or a clean tea towel, then set aside to prove for 1 hr more. Heat oven to 220C/200C fan/gas 7. Mix the flour with about 5 tbsp water to make the paste for the cross – add the water 1 tbsp at a time, so you add just enough for a thick paste. At this stage you can brush with maple syrup for a more browner bun. Spoon flour mixture into a piping bag with a small nozzle. Pipe a line along each row of buns, then repeat in the other direction to create crosses Bake for 20 mins on the middle shelf of the oven, until golden brown. Brush with maple syrup over the top of the warm buns and leave to cool. 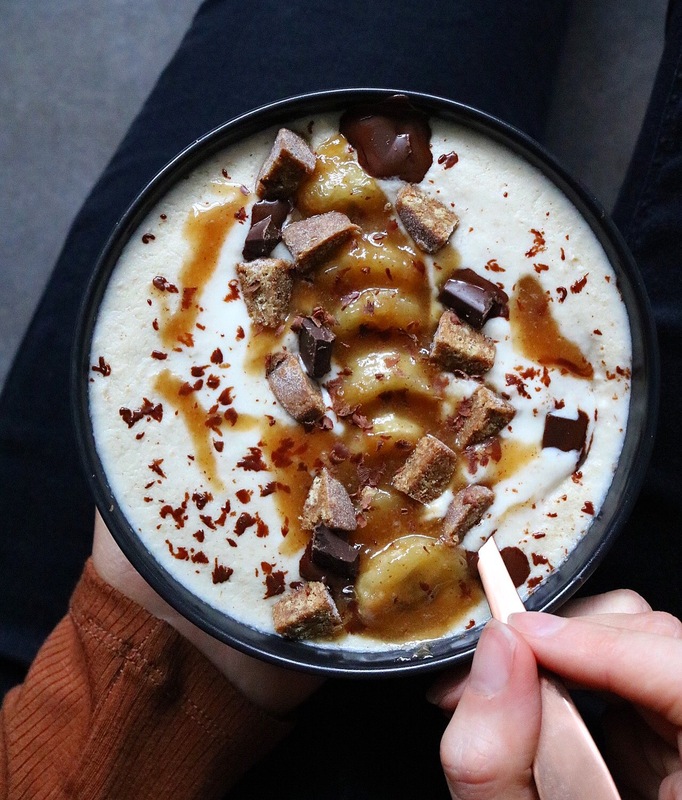 Banana and toffee were made for each other right? yes! 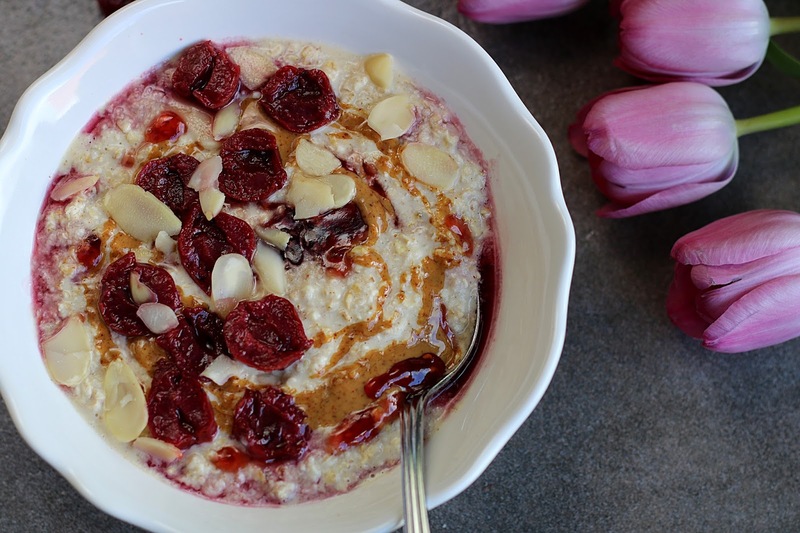 add in some dark chocolate to the mix and you have a very indulgent breakfast. Perfect for the banana toffee lover. 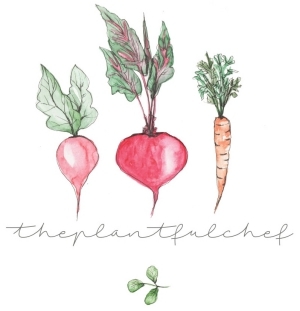 1 cup of plant milk, cook to desired consistency. mix up maple, nut butter and plant milk and place in the pan with the banana. Cook for 5-7 minutes on medium heat until caramel thickens. Chop up some trek bar bits (toffee triumph) and small chunks of dark chocolate to serve. I had to include this as an exclusive recipe on here as i posted this photo a while a go and since I've made them i have not used my air fryer anymore. These wedges are so tasty crisp on the outside and fluffy in the middle, theres barely any oil in this recipe just a few steps to make sure you get the best result. Chop up your potatoes into wedge form and place in cold water in the microwave for 7 minutes full powder. Drain water and dry the wedges with a paper towel you want to get all the starch off them. Once dry coat with the oil and spices transfer onto some baking paper and place in the oven at around 200c fan for around 1 hour turning half way through. if at the last ten minutes of the hour the fries are still looking pale turn up the heat to full and watch them carefully.